National Milk Records plc, the ISDX-quoted leading supplier of dairy and livestock services, has released its interim results for the six months ended 30 September 2013. Following its AGM and Board meeting held on October 28, 2013, it has also appointed two new executive directors to its main Board; Jonathan Davies and Ben Bartlett, with immediate effect. Commenting on the results, NMR Board Chairman Philip Kirkham says: “Once again, we are reporting an increase in our turnover and profits for the first six months of our 2013 financial year, which provides us with a solid foundation for our full year financials. These positive results are testament to improving macro conditions in the dairy sector, and also endorse our on-going operational efficiency following our re-structure which was reported in our final results for the year to 31 March 2013. The NMR Board also agreed the appointment of two new executive directors; Jonathan Davies and Ben Bartlett with immediate effect. Jonathan Davies studied at the Welsh Agricultural College, Aberystwyth and then gained a diploma in surveying at the University of Reading. He is a member of the Royal Institution of Chartered Surveyors and a Fellow of the Central Association of Agriculture Valuers. Based in south Wales, he runs a small herd of Hereford and Welsh Black Cattle in his spare time. He has held positions with Genus Management and with the Milk Marketing Board then with Milk Marque as quota agency manager. He is currently national field and marketing manager, responsible for a team of more than 400 recorders and area business and sales managers. Ben Bartlett holds a degree in agricultural economics from the University of Reading and a diploma in management studies from De Montfort University. He has held roles as an economist with the then Ministry of Agriculture, Fisheries and Food in Whitehall, London and with the Meat and Livestock Commission. 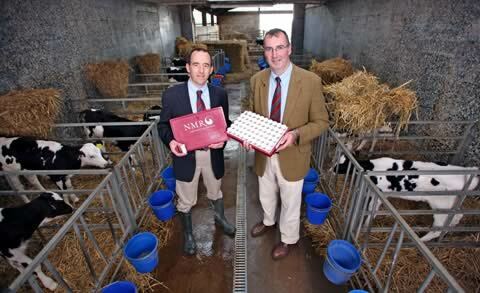 He is currently a director of the NMR Group’s National Milk Laboratories and of Independent Milk Laboratories Limited, a joint venture between Progressive Genetics and NMR operating in Ireland.